Anyone who’s seen anything in the news lately about the plight of the Rohingya, a self-identified Muslim minority living on the border of Myanmar with Bangladesh, is likely to have read something to the effect that they “have been stateless since they were collectively stripped of their citizenship in a 1982 citizenship law that recognized 135 ethnic groups”. Journalists, human rights defenders and scholars variously iterate statements about how this law specifically took away the citizenship of hundreds of thousands of people. In fact, Myanmar’s citizenship law contains no reference to the 135 ethnic groups that today make up the country’s official “national races”. Nor does it include any specific sections to deny Rohingya citizenship. The law does privilege people belonging to certain loosely defined racial categories over others—that is to say, people classed as ostensibly being among the original, pre-colonial inhabitants of the country. But the present-day statelessness of Muslims in the west of Myanmar is essentially a result of de facto, rather than de jure, measures. To make sense of how the 1982 law privileges some groups and excludes others, and with what consequences, we need to compare it with its predecessor, the 1948 Union Citizenship Act. The earlier law incorporated provisions giving special recognition to a non-exhaustive list of ethnic groups, then designated “indigenous races” and later national races, namely “Arakanese, Burmese, Chin, Kachin, Karen, Mon or Shan races and such racial groups as have settled in any of the territories included within the Union as their permanent home anterior to 1823AD”. It acknowledged the general right to citizenship of these categories of people, but it did not limit citizenship to them. On the contrary, it stated that any person whose forebears had lived in Burma, as Myanmar was then officially known, for at least two generations would be deemed a citizen. And it went on to offer a range of other conditions that would suffice for citizenship. In other words, although race did feature in the 1948 law, it was not prominent. Whether a person was a member of a “national race” or not was largely incidental to the question of citizenship prior to 1982. The insignificance of ethnic or racial categories for the purposes of determining Burmese citizenship before 1982 is obvious from a glance at identity documents issued in the period. The original National Registration Card or “green card”, which the government began to issue in 1952 under the 1949 Union Residents Registration Act, contained no space to identify whether a person was a member of a national race or not. Nor, for that matter, did it indicate what their race or religion was. No government department throughout this time even had authority to issue a document certifying that a person belonged to a specific racial or ethnic category. The 1982 law turned the contents of its predecessor on its head by making ethnic identity, which is to say, membership in a “national race” category, the primary basis for citizenship. It achieved this result in two steps. First, it declared, similar to its forerunner, that, “Kachin, Karenni, Karen, Chin, Burman, Mon, Arakanese, Shan and other national races and ethnic groups who resided in an area of the state as their permanent home anterior to 1823AD are Burmese citizens.” But unlike in 1948, it offered no other avenues via which a person may become a full citizen. Second, the 1982 law individualized this provision in a way not done previously, by declaring that, “All persons born of the national races, or all persons born of parents both of whom are of national races are citizens.” Whereas in the prior law the person’s individual claim to citizenship was independent from their ancestry, in 1982 not only were individual claims and lineage bound together but also questions of ethnicity preceded and determined a person’s status as a citizen. Because the contents of the 1982 law appear to have the effect of automatically denying citizenship to certain categories of persons, like Muslims of South Asian descent, writers on the topic conclude that the law stripped Rohingya of their citizenship. But this conclusion is inattentive to the law’s contents, and misconstrues the type of regime with which we are here concerned. The 1982 law was not retroactive. Its regressive, racialist contents notwithstanding, it clearly provided that nobody who already had citizenship would lose it, unless they had acquired it by deceit. This provision should have functioned to prevent mass statelessness by enabling existing documented citizens to transfer over to the new regime without having to prove their lineage under the latest rules. But at this point we move from questions of the law’s contents to its application, and to the character of the regime responsible for its enforcement. After the 1982 law passed the legislature, initially not much happened. Burma’s bureaucracy embraced it with characteristic creative inertia, doing nothing. Nor did officials move to put the law into effect having completed and issued a set of procedures for its implementation, over a year later. Work to exchange the old green cards for new pink Citizenship Scrutiny Cards appears only to have begun in 1985. Even then, it seems to have been conducted lethargically and without fanfare. It was not until a new military junta with a renewed appetite for ridding the country of alleged foreigners took power in 1988 that the law got enforced with vigour. Given that the Muslim population of western Burma was probably among the better-documented frontier groups in the country at the time, the re-registration process should not have presented unusual difficulties for many of its members. Limited available evidence suggests that people expected to hand in their green cards and after a time get new pink ones instead. But, registration officers apparently acting on orders from superiors to stamp out the use of fake identity documents in the border region adopted the expedient of declining to re-register most Muslims. If in 1990 you were living in a township on the border of Bangladesh and were designated “Bengali”, you would not receive a pink card. Furthermore, those people who had submitted green cards with their applications to obtain the new pink ones did not have their green cards returned to them, but instead were issued with Temporary Registration Cards, or “white cards”. The issuance of white cards to those people who had surrendered their old green cards is intelligible only when interpreted in terms of a regime for which departure from domestic law is both routinized and unproblematic. Under the 1949 registration law and rules that followed in 1951, these cards were intended, as their name suggests, as temporary documentation. They were supposed to be issued when somebody needs to submit further evidence to get a green card, or loses a card and applies to get a new one issued but requires an interim document. They were never intended as alternative permanent documents for non-citizens residing in Myanmar, for whom yet another type of certification exists. Nevertheless, white cards were from the early 1990s until end of March 2015 treated as proxy identification for people denied citizenship who nevertheless were born, have lived, and will likely die in Myanmar. Thus, the process of rendering stateless hundreds of thousands of people on the border of Myanmar with Bangladesh was not achieved by complying with the terms of the 1982 Citizenship Law, even though its contents were in their general intentions inimical to the interests of the affected population, but rather, through their breach and selective application. 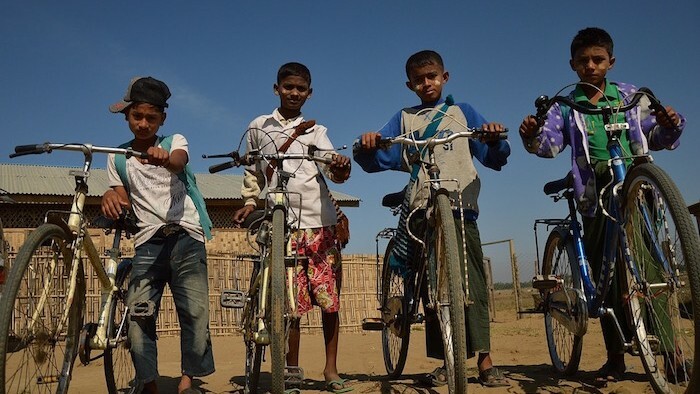 Having been denied citizenship wholesale, people identifying as Rohingya logically started making political claims to get it back: logically, because existing juridical arrangements in Myanmar encourage if not compel people to make political claims that they constitute distinctive ethnic groups, precisely because to belong to a national race is under the 1982 law both the gold standard for membership in the political community “Myanmar” and also a guarantee of membership. Yet Rohingya who make such claims risk giving umbrage to those groups who already are counted among national races, who resent the idea that Muslims of South Asian descent might also be included in their numbers. Tension between the inherent logic of juridical arrangements that push people to make political claims to a salient ethnic identity and the stiff opposition that those claims encounter among the majority of Myanmar’s population drives the physical and structural violence against Muslims in Myanmar’s west. To be Rohingya is to ascribe to an identity that is both politically and juridically off-limits. A person who identifies as Bengali is perfectly entitled to present their credentials and make an individual claim to citizenship under the terms of the 1982 law. But assertions of a collective right of people who identify as Rohingya to political membership by virtue of being a national race are not tolerated. Yet, the Citizenship Law itself concedes to the politically intolerable. The law stipulates that the peak executive body in the country has the authority to determine whether or not an ethnic group constitutes a national race. The procedures for implementation of the law also recognize that apart from the eight major national race groups listed in the law, “Many other races and ethnic groups that are national races remain.” On paper, the law holds open the possibility that yet more groups than the 135 currently designated as national races might one day be added to their number. The Rohingya political claim to be among the national races, and hence to be entitled to citizenship as a collectivity, rests on this possibility. But to make the claim, they must also subscribe to the racialized logic of the 1982 citizenship regime. Consequently, rather than question the premises that inhere to citizenship in Myanmar, Rohingya advocates elide them. Rather than oppose the underlying premises of the arrangements for citizenship on the basis of ethnicity, they challenge only the proposition that Rohingya are not included in the 135 groups to which citizenship automatically accrues. Ironically, and tragically, the surpassing symbolic and juridical power of “national race” identity is for the Rohingya at once their problem and their solution. Union Citizenship Act, No. 66/1948, section 3. The year 1823 was the year immediately prior to the first Anglo-Burmese law. Citizenship Law, No. 4/1982, section 3. Author’s translation. Citizenship Law, section 5. Author’s translation. The cards were annulled via President’s Office Notification 19/2015, 12 February 2015. New interim cards have since been issued. Procedures Concerning the Citizenship Law, Council of Ministers Notification No. 13/83, paragraph 9. Author’s translation. Dr. Nick Cheesman is a research fellow in the Department of Political and Social Change, Australian National University, and author of Opposing the Rule of Law: How Myanmar’s Courts Make Law and Order (Cambridge University Press, 2015).